We have a restaurant in Stockholm called Berns Asiatiska which I’ve always heard is supposed to be really good. The venue is a hotel, restaurant, night club, and event venue – for example there are often shows there during Stockholm Fashion Week – and I’d been to the night club before, but not the restaurant. I’d heard a lot about it though, especially the brunch buffet. It’s quite expensive, but apparently worth it with a number of sushi, dumpling and other hot food options available. But they say the best thing is the dessert buffet. In February we were getting an influx of new people at work (they have two big dates – one in February and one in September – where all the newly graduated lawyers start) and decided to go for a group lunch at Berns. Because we were such a large group we were given three options to pre-order our lunch from, and I chose their Thai meatballs in red curry. I’m not usually a huge fan of curry – I have too many bad memories of curry powder flavoured things from school – but the other two dishes had too many things in them I didn’t like and I’d heard good things. Thai curry is also more to my taste than Indian curry, because it often has coconut milk and lemon grass and such in it. Either way though, I was definitely both impressed and pleased with the dish. Fast-forward to yesterday and the eternal ‘what do I do for dinner today while my slow cooker makes food for the week?’. I’d had a lingering craving for Asian food since we’d had Thai takeaway on Saturday and had found a chicken and cashew nut recipe for the slow cooker I was going to throw together for my lunch boxes for the week, but still couldn’t shake that craving. 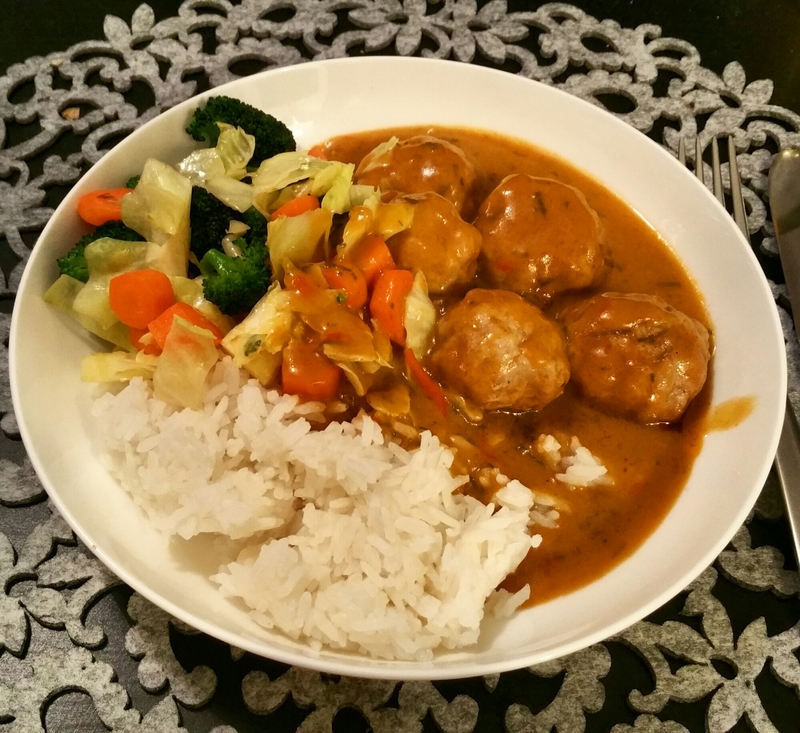 So I was browsing Ica’s Asian recipes and came across a recipe for chicken meatballs in a Phanaeng curry which made me think about the Thai meatballs at Berns. Though I don’t think they were made of chicken and I know they were served in a red curry sauce, I figured that the Ica recipe would still be a nice way to fill that craving. The recipe was very simple and called for basically four things: sesame seeds, chicken mince, Phanaeng curry sauce, and a wok-mix of vegetables. However, my local Ica didn’t have the ready wok-mix, so instead I just bought some of what was in it and chopped it up myself. You could probably use frozen vegetable mixes as well though, depending on what you want in yours. Also, I added bread crumbs to my meatballs, because I didn’t feel like they were holding together very well when I was first trying to roll them. Boil the rice as per the instructions. Mix the mince, sesame seeds, salt, and bread crumbs and shape into balls. I found the mince mix very sticky and felt that it helped to grease my palms with a bit of oil. Bring the Phanaeng sauce to boil in a pan/pot, then add the meatballs and reduce to a simmer. Cover the pan/pot with a lid and leave to simmer for 8 minutes, turning the meatballs over halfway through. In the meantime stir-fry your vegetables in the oil. The original recipe said to use 300g mince, but because they only had chicken mince in 500g packs, I used the whole 500g and therefore got three quite big portions out of this. In fact, I didn’t eat all the meatballs with each portion, so I could have probably made it into four portions instead. I would, however, recommend that if you do use 500g mince instead of 300g, you also increase the amount of sauce somewhat. I only used the 400 ml stated in the recipe (and above) and I felt like I would have wanted a bit more. Whether you want to add more vegetables is up to you, but for three portions I thought it worked out quite well.